Happy 50th Birthday, Michael Jordan!! On Friday, September 11, 2009, I walked into one of the campus dining centers to pick up lunch. I stopped dead in my tracks when I looked at the footage on the big screens. My heart started beating faster. The volume of course was turned down. In my mind, I was freaking out. Please don't tell me something happened. My heart can't take it! I stood there watching all of this game and interview footage of Michael Jordan thinking that the only time the media goes into the vault is when something tragic happens. I was skiddish because it was just over a couple of months prior that we lost the other MJ, one of my hometown heroes. I remembered watching footage of Michael Jackson on a tv screen with the volume turned down at the gym, the day he died. That moment on campus felt like deja vu. I was surprised at how Michael Jackson's death hit me and I had somewhat of a love/hate relationship with him. With Michael Jordan, nothing but love. If losing the other MJ was hard, losing this MJ would have been terrible for me. So I stood there still with people asking me if I was in line to order. I just shook my head no, not taking my eyes of the screen nervously waiting to find out what was actually going on. I stood there waiting for ESPN to flash the headline on the screen. Then finally I read that Michael Jordan was being inducted into the basketball Hall of Fame. I let out a huge sigh of relief and laughed at myself too. 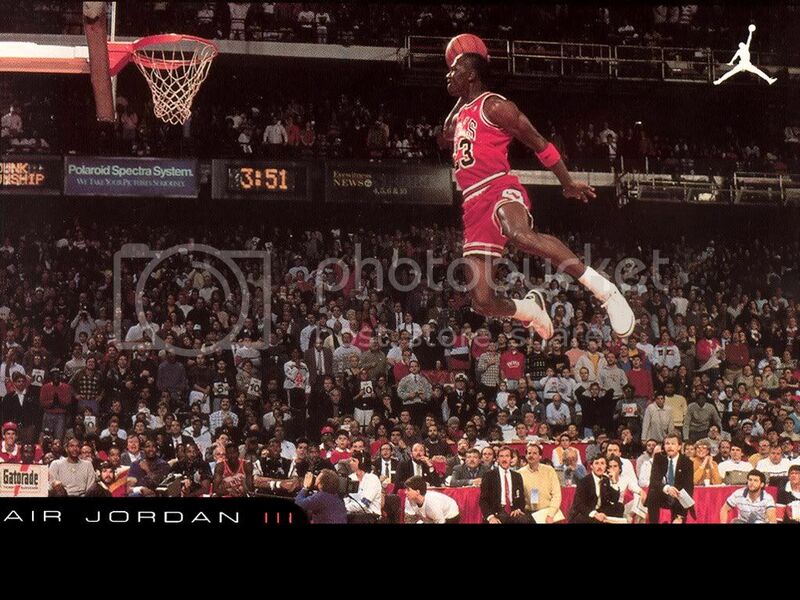 Yesterday, February 17, 2013, MJ, the GOAT, turned 50 and I have just been reminiscing on some good times. I was a mega-Chicago Bulls fan. When I turned 16, I applied to be a ball girl thinking I could take the South Shore train over to Chicago a couple of nights a week. But my mother said no. She just looked at me and said, "you will NOT be going to Chicago and staying late after games." The real safety implications hadn't even occurred to me. We frequented the city enough, that I knew my way around and I thought I could handle it. Well wisdom and pragmatism prevailed. I was not a ball girl but I remained an avid fan. I had Bulls' posters all over my bedroom walls. The Chicago Bull-head logo was on of the first things I saw when I woke up in the mornings. I knew my parents were not going to pay over $100 for a pair of Jordan's. I saved my money and put a pair on layaway at the local Foot Locker. I wore them as often as I could. I wish I had kept them. I'm not hard on shoes. I still wear the same size. It would have been cool. I think one day I will go back and start a collection again. Somehow in my various transitions, I was not careful about keeping some key memorabilia that I had collected. I really regret that. Even with all of the fascination with Kobe and LeBron, I do not think there is any argument that Michael Jordan is in fact the greatest basketball player of all time. My fascination came as result of being bored one night and liking sports enough to watch the only worthwhile thing on tv, a Chicago Bulls game on WGN. It turned out to be a good game and I was hooked ever since. I'm just glad I can say that I watched him play in real time. I do not have to refer to ESPN Classics to know more about the man. My generation came of age during his reign in the NBA. Some of my favorite pictures are Chicago Bulls' game time moments. Obviously I haven't followed him closely after his retirement, otherwise I would not have nearly had a breakdown that September day. After watching a quick segment on the TODAY show this morning about his birthday, I started smiling recalling some fun times watching him, Scottie, BJ, Horace, Phil, Ron, Kukoc and 'em tear it up on the court. Sometimes I dream that he is me...like Mike. If I could be like Mike. I wannabe, I wannabe like Mike...if I could be like Mike. Happy Birthday Michael Jordan! The greatest basketball player of all time, no contest with anyone else being as good. I am proud to say I was a MJ fan when he was playing!